Complete Flashings, Incorporated is located in Bensenville, IL and services all of Illinois with a wide variety of Custom Roofing, Architectural Sheet Metal and Gutter Systems. We specialize in New Construction, Residential Tear Off and installation, Commercial Roofing, Roofing Repairs, Skylights, Venting Solutions, Custom Finials, Weather Vanes and Cupolas. 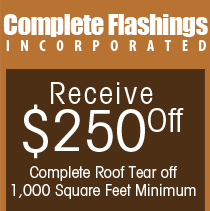 Complete Flashings, Incorporated is a family owned business with more than 40 years of experience. We are committed to providing quality work to exceed your expectations and guarantee satisfaction.